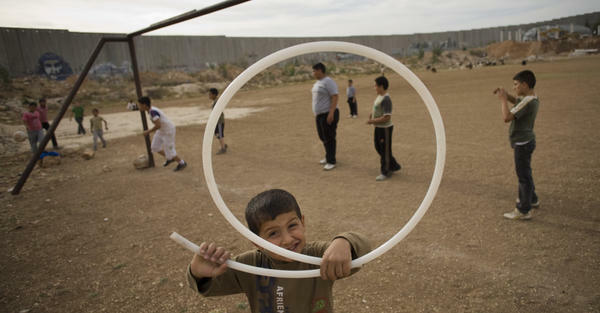 Palestinian children play next to Israel's separation barrier in the West Bank town of Abu Dis in 2011. As peace talks between Israel and Palestine remain at a standstill, people are looking to other possible solutions. Peace talks between Israelis and Palestinians are at a standstill and have been for almost two years. The stated aim of those negotiations is what is known as the "two-state solution," which means the establishment of a viable, independent Palestinian state existing in peace alongside Israel. But as hopes for an agreement diminish, Palestinians — and even some Israelis — are now talking about other solutions to the conflict. Among them, the so-called "one-state solution." Former Palestinian Prime Minister Ahmed Qurei has been a point person in some of the most important negotiations on the Israeli-Palestinian conflict. "We deal since Madrid with eight Israeli prime ministers," he said, referring to the 1991 Madrid Conference to start a peace process involving Israel, the Palestinians and Arab states. So it caused something of a stir when Qurei wrote a piece calling for an end to the two-state solution. He wrote that it was dead in all but name, and that the time had come to explore other options. NPR spoke with Qurei at his offices in Abu Dis, his hometown in the West Bank. He said the reality on the ground is that a viable Palestinian state is no longer possible. "Any settlement that will not include East Jerusalem as capital of the state of Palestine, nobody will accept it," he said. "And if you annex it, as the Israelis did now in advance, it means you cut the head of the state of Palestine." Israel claims all of Jerusalem; Palestinians want East Jerusalem as the capital of their future state. So the one-state solution is being talked about increasingly in many circles. This isn't a new idea. It's been around since the founding of Israel. But lately, it's been gaining traction, at least among some Palestinian intellectuals. In its broadest definition, the one-state solution would mean absorbing the West Bank and perhaps even the Gaza Strip and all of its Palestinian population into a greater Israel, where everyone would have equal rights. "What, for me, the idea of one-state is about is ... breaking apart the system of privilege that exists and being able to live as an equal," says Diana Buttu, a former legal adviser to the Palestinian negotiating team. "That's the kind of state that I'm looking for." Buttu is currently at Harvard, where she organized a conference on the one-state solution. She says equality under the law is the main aim of the one-state option. "What we are talking about is a state which represents all of its citizens, where there isn't preferential treatment given in laws or in policies to one's religion," she says, "where in fact the issue of one's religion has practically no say in terms of what goes on in a person's life." But the one-state solution is an idea that many Israelis view with dismay. Israel was founded after the Holocaust as the homeland of the Jewish people. Absorbing millions of Palestinians would mean that eventually — because of birth rates — Israel would no longer be predominantly Jewish. That, Israelis say, will mean an end to the Jewish state. But there are also those on the Israeli side who are calling for drastic action. Yossi Beilin was the lead Israeli negotiator in the secret Oslo peace talks that produced an agreement in 1993; that deal was supposed to pave the way to an independent Palestinian state. This past week, he wrote an open letter advising that the Palestinian institutions the Oslo Accords put in place — namely the Palestinian Authority — should be dismantled. "I think it is time to say enough is enough. The Oslo process has ended, and now what we have to do is to go toward a permanent solution, if possible," he said on Al Jazeera. "If not, let us dissolve the institutions which were built and which perpetuate, actually, the interim agreement forever." Beilin says a radical step, like dismantling the Palestinian Authority, would force Israel into an agreement. "If something like that happens, and the Palestinians are saying to ... the Israelis, 'OK, these are the keys. Take the responsibility, pay for our services' ... I think that something must move then," he says. Palestinian President Mahmoud Abbas is said to be considering the move, though many analysts consider it unlikely that the Palestinian Authority will be dissolved anytime soon. In fact, most observers here say the talk about alternatives to the two-state solution is just that — talk — and that nothing is going to change here in the near future. And with peace talks between Israel and the Palestinians at a standstill for nearly two years now, we're going to hear from some on both sides who are calling for new thinking on a possible solution. Traditional negotiations have focused on a two-state solution - that is, an independent Palestinian state existing in peace alongside Israel. NPR's Lourdes Garcia-Navarro has this report on alternatives being proposed by those who are frustrated and losing hope that an agreement can be reached. LOURDES GARCIA-NAVARRO, BYLINE: Ahmed Qurei is a former Palestinian Prime Minister and has been a point person in some of the most important negotiations on the Israeli/Palestinian conflict. AHMED QUREI: We deal since Madrid with eight Israelis prime ministers. GARCIA-NAVARRO: And so it caused something of a stir when he wrote a piece calling for an end to the two-state solution. He wrote that the two-state solution was dead in all but name and the time had come to explore other options. NPR spoke with Qurei at his offices in Abu Dis, his hometown in the West Bank. He says the reality on the ground is that a viable Palestinian state is no longer possible. QUREI: Any settlement that will not include East Jerusalem as capital of the state of Palestine, nobody will accept it. And if you annex it - as the Israelis did now - in advance, it means you cut the head off the state of Palestine. GARCIA-NAVARRO: And so what's being talked about increasingly in many circles here is the so-called one-state solution. This isn't a new idea. It's been around since the founding of Israel. But lately it's been gaining traction, at least among some Palestinian intellectuals. In its broadest definition, the one-state solution would mean absorbing the West Bank and perhaps even Gaza and all of its Palestinian population into a greater Israel where everyone would have equal rights. DIANA BUTTU: What for me the idea of one state is about - is about breaking down the system of privilege that exists and being able to live as an equal. That's the kind of state that I'm looking for. GARCIA-NAVARRO: That's Diana Buttu, a former legal advisor to the Palestinian negotiating team. She's currently at Harvard where she organized a conference on the one-state solution. Buttu says equality under the law is one of the main aims of the one-state option. BUTTU: A state which represents all of its citizens, where there isn't preferential treatment given in laws or in policies to one's religion, where in fact the issue of one's religion has practically no say in terms of what goes on in a person's life. GARCIA-NAVARRO: But the one-state solution is an idea that many Israelis view with dismay. Israel was founded after the Holocaust as the homeland of the Jewish people. Absorbing millions of Palestinians would mean that eventually, because of birthrates, Israel would no longer be predominantly Jewish. And that, Israelis say, will mean an end to the Jewish state. But there are also those on the Israeli side who are calling for drastic action. Yossi Beilin was the lead Israeli negotiator in the secret Oslo peace talks that produced an agreement in 1993 that was supposed to pave the way to an independent Palestine. This past week, Beilin wrote an open letter advising that the Palestinian institutions the Oslo Accords put in place – namely, the Palestinian Authority - should be dismantled. Here he's speaking with Al Jazeera. DR. YOSSI BEILIN: I think that it is time to say enough is enough, the Oslo process has ended. And now what we have to do is to go towards a permanent solution, if possible. If not, let us dissolve the institutions which we have built, and which perpetuate, actually, the interim agreement forever. GARCIA-NAVARRO: Beilin says a radical step like dismantling the PA would force Israel into an agreement. BEILIN: If something like that happens, and the Palestinians are saying to us, to the Israelis, OK, these are the keys, take the responsibility, pay for our services and whatever, I think that something must move then. GARCIA-NAVARRO: Palestinian President Mahmoud Abbas is said to be considering the move, though many analysts consider it unlikely that the Palestinian Authority will actually be dissolved any time soon. In fact, most observers here say the talk about alternatives to the two-state solution is just that, talk, and that nothing is going to change here anytime soon. Lourdes Garcia-Navarro, NPR News, Jerusalem. Transcript provided by NPR, Copyright NPR.